62.5 year old patient with metastatic GEP NET before PRRT (A) and three months after PRRT (B). Maximum-intensity-projection PET images (coronal views) are shown on left; fused and unfused CT images are shown on right. The arrow indicates the selected lesion. 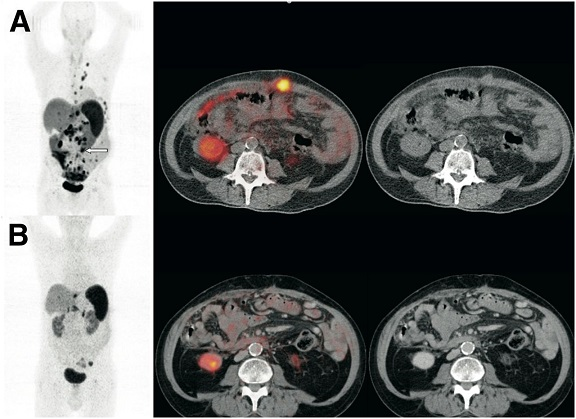 Radiotherapies using peptide-receptor targeting radionuclides function in much the same way as other personalized therapies by pinpointing a particular physiological function that is overactive in tumor cells. Radiopeptides are analogs of natural hormones called somatostatins. Synthetic somatostatins like the man-made octreotide bind to somatostatin receptors in tumors and particularly neuroendocrine tumors of the bowel, stomach, lung, pancreas and other organs of the neuroendocrine system. PRRT combines a therapeutic dose of a radioactive source, such as Yttrium-90, Indium-111 and lutetium 177 and octreotide to kill different kinds of tumors depending on their stage, structure and depth.